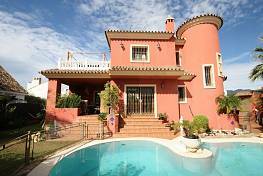 LUXURY VILLA IN ALTOS REALES THE MOST SECURED AREA OF MARBELLA. 5 bedrooms plus maiden room, 4 bathrooms, separate living and dining area, TV-room, large modern kitchen with breakfast area, covered terrace, guest toilet, gym, wine cellar, cinema room with bar, billiard room, storage, machine room and garage for 3 cars. Lift, Music system throughout the villa, Air conditioning, Under floor heating. BBQ area and covered garden sitting area. 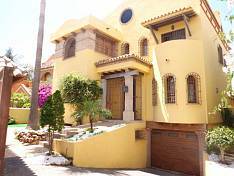 5 minutes from Marbella centre. Urbanisation is fenced in, has 40 video cameras, only one entrance and 24 hour guarded, extra night guard.